Eileen Elliott as she poured wine for customers at the Tasting Counter in Somerville. 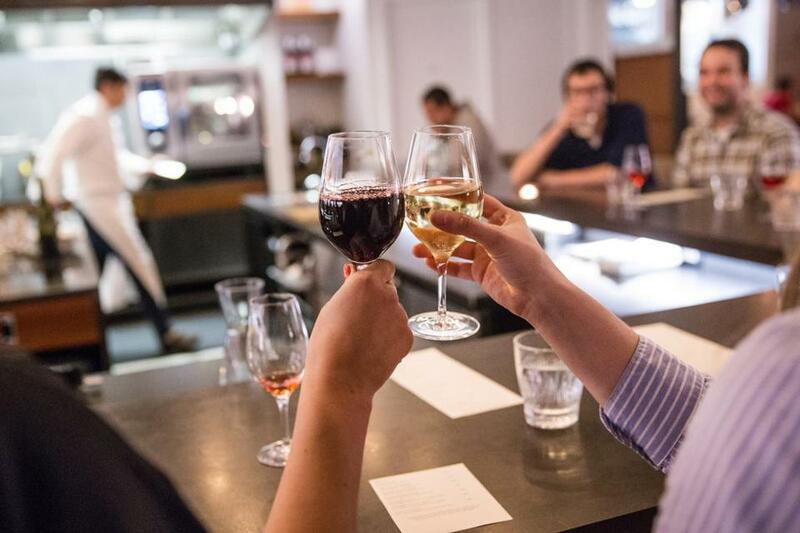 Tasting Counter, best known for its meticulously crafted, multicourse tasting menus, is expanding the hours of its more casual wine bar. Chef-owner Peter Ungár has been thinking about the expansion for a while now. “It was always our hope to have the wine bar five nights a week,” he says. While the late-night concept has existed since the restaurant opened in 2015, he and his team have polished up the format and now make it available every evening they are open. On Wednesdays through Saturdays, the start time is 10:30 p.m., right after dinner service. Tuesdays offer an all-wine-bar affair, and doors slide open at 5 p.m. “It’s for guests who may not be able to come at 10:30,” he says. That’s good news for folks who rarely venture out late on a school night. 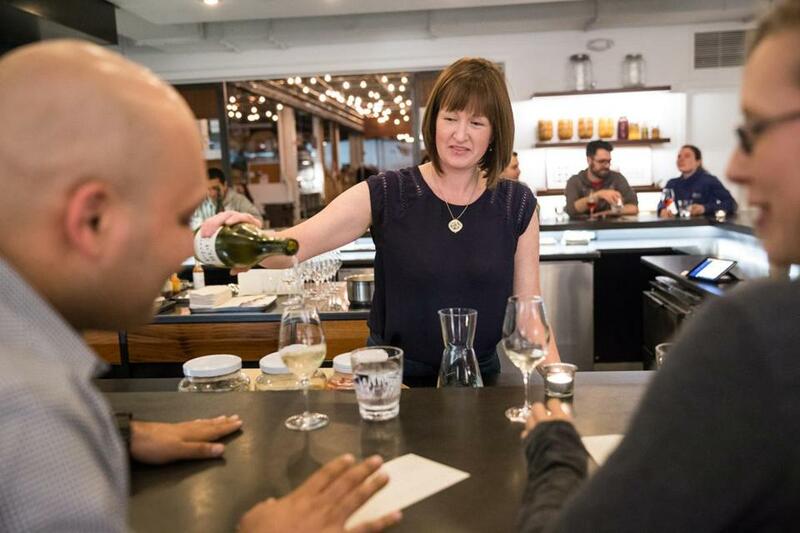 Tucked into Somerville’s Ames Business Park, the same cavernous space that houses the Aeronaut Brewing Co., this warmly modern spot offers a relaxed, come-as-you-are vibe when wine-bar hours begin. Unlike at dinner and lunch, for which one purchases tickets online and ahead of time, wine bar guests order a la carte, and pay at the end (tax and tip are included in the prices). “It’s funny to say, but it’s like a ‘normal’ restaurant,” Ungár says about how it’s organized. One evening, beverage director Eileen Elliott is behind the counter, happily suggesting glass pours and plates to a group of twentysomethings. Soon after, she’s bantering with two silver-haired professor types about the night’s selections. Seven small plates ($5 to $15) are on the menu, including hamachi brandade, three meatball-size fritters nestled in saffron-infused tomato sauce, adorned with shaved fennel. Tandoori-style squab is also on offer, as well as rhubarb clafoutis. A dozen pours by the glass ($8 to $13) are distinctive, and not the usual suspects. Customers as they raised their glasses at the Tasting Counter in Somerville. If you’re curious about these wines, this place provides a low-risk way to try them. Everyone here wants you to be delighted with what’s in your glass. Down the bar, a customer tastes a skin-macerated white with a tinge of sherry-like oxidation. “It’s interesting,” she says. Elliott, who can tell the guest appreciates it, but doesn’t love it, is quick to offer other choices, including a rosado hailing from Sicily’s Mt. Etna. The guest takes a sip of the pink. “I love this!” she says. Clearly, it’s a wine worth staying up late for. Wine bar hours at Tasting Counter (14 Tyler St., Somerville, 617-299-6362, www.tastingcounter.com) are Tue 5 p.m.-12:30 a.m., Wed-Sat 10:30 p.m.-12:30 a.m.